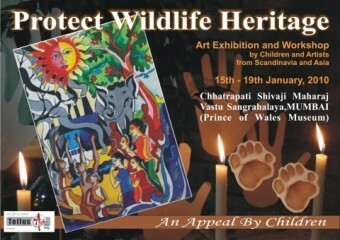 Eva Dillner is one of 15 Swedish artists chosen for the TellusArt project "Protect Wildlife Heritage - An Appeal by Children" Art Exhibition and Workshop by children and artists from Scandinavia and Asia at the Prince of Wales Museum in Mumbai, and..
Nov. 18, 2009 - PRLog -- "I'm thrilled to be part of this exciting project. TellusArt's innovative approach for networking and cross pollenization of cultures, blending artists and children through workshops and exhibitions, feels like a wave of the future. Here we find a playful approach to raise awareness for environmental and social issues that encourage dialogue and exchange. Children are our future and their minds aren't yet limited by what can't be done. The language of art goes beyond rhetoric and artists can help stretch the boundaries, creating new paths. My hope is that we can help the world see things in a new way. The earth needs our attention and loving care. If we are at all tuned in to the beauty of nature and animals in the wild, we can't help but want to do our part." Art for a cause. TellusArt is committed to providing a global platform to outstanding and upcoming artists from all over the world through exhibitions, workshops and projects related to art. We are also committed towards highlighting through the power of art, issues that need collective human attention and participation to resolve. All living beings are woven inextricably in the web of life. When any link in that chain is harmed, others will be affected. Earth is home to an estimated 10 to 20 million species. Although extinction is a natural process, there is nothing natural about the rate at which organisms are presently disappearing. Over-exploitation of wildlife for commercial purposes, the introduction of harmful exotic organisms, environmental pollution, and the spread of diseases pose serious threats to our world’s biological heritage. Ecologists predict that 50 per cent of all mammals and birds will be extinct within the next century. The loss of these resources threatens the functioning of natural systems and the overall well being of human society. Giant pandas, tigers, polar bears, endangered whales and dolphins, rhinos, elephants, marine turtles and great apes are species that not only need special measures and extra protection in order to survive, they also serve as umbrella species: helping them helps numerous other species that live in the same habitats. Art Exhibition and Exchange Workshop for artists from Punjab, Haryana, Himachal and Scandinavia. Find out more about TellusArt on http://www.tellusart.org and how you can be part of this global journey. Eva Dillner is a writer and artist specializing in creative and therapeutic processes for inspiration and transformation. Through her company Divine Design she publishes directly via Lightning Source, making her books and calendars available worldwide through major distributors and on-line retailers as well as the Espresso Book Machine. For audio she has teamed up with leading edge provider ELib in Sweden and Audible in the USA. Her e-books are available via Elib's network and on Amazon's Kindle. Next up is a partnership with Mi-Vox for preloaded audio players to be released by Christmas 2009.